We are a team of extremely talented and experienced visual communicators. Specializing in providing our clients unique solutions to the problems that keep them up at night. Our comprehensive services allow us to execute authentic brand experiences across various channels and mixed-mediums. We view our clients as partners. We also strive to forge long-lasting relationships based on quality and reliability. This unique synergy between talent and work ethic allow us to produce captivating marketing solutions on time, every time. From marketing strategy to creative concept development and execution, our team has the ability and resources to deliver exceptional results. Kubota Canada and the CFL teamed up to kick off their annual In The Stands contest. From start to finish we developed bilingual marketing materials across various media. Project deliverables included: brand development, data capture microsite, digital and print advertising. 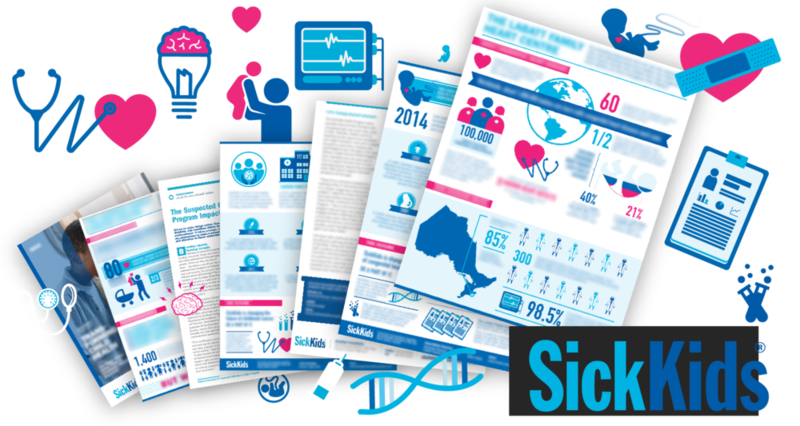 Working with the good folks at the SickKids Foundation, we developed friendly, easy to understand information graphics that highlighted donor and patient statistical data. Our friends at Wasabi needed a fresh new site to showcase the company’s custom experiential and event marketing capabilities. Something clean and friendly on every device. We think we nailed it. We love making life easy for our clients. Want to get in touch and see if we would be a good fit for your group? Start by sending us a note. We’re always on the lookout for resourceful creatives who are efficient, intelligent, and up for a challenge. Our days are often filled with the unexpected, which requires us to be nimble and adapt with ease. We work in both print and digital fields so being well versed in both is a must. If you think you fit these criteria, contact us.